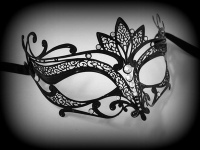 Make a statement in one of our most intricate masks to date, each Panache mask boasts an array of the highest quality looks & features a gloss nero black painted cut metal filigree shaped in to elegant scroll effect and embellished with authentic Swarovski crystal. 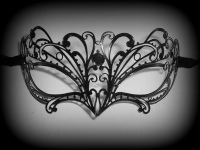 Part of the exclusive filigree range by Simply Masquerade, this classic Panache mask would add a touch of luxury to your masquerade wardrobe & will ensure you're always one step ahead of the party fashion trend. 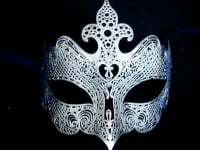 With traditional satin ties this mask is for women who aspire to be the best. Petite fitting that will fit most face shapes.